I received an ARC of this book from the author, James A. Owen. Thanks James! This is the book you will reach for time and time again. It’s a quick read (less than 90 minutes) but the messages and inspiration will stay with you. 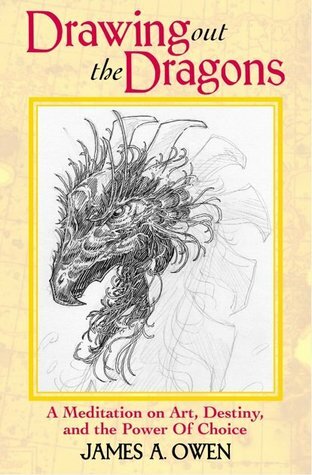 James A. Owen, master story weaver, tells a different story with Drawing Out the Dragons. Instead of dragons and mythical lands, he write about illness, Superman rings and Hollywood. This autobiographical story pulls the reader in and refuses to let go. Need inspiration? It’s here. Need motivation? It’s here. Need entertainment? It’s here. Not only have I read and reread this book, I read it to each of my 8th grade classes. Some lessons are best learned early — and James provides them. No matter if you are young, or not-so-young, you will find what you are looking for in Drawing Out the Dragons. The content of this book is appropriate for all ages, but will be best appreciated by readers (and listeners) ages 11 and up.